Those of you who have been following my "Random Band of The Week" posts will recognise Mors Voluntaria, as I did a brief write-up this band. Shortly after that, though the owner of Depressive Illusions Records, I was able to contact the person behind the project, so I could pass the link to that write-up on to him. We got chatting and he sent me the tracks to the tape that he released through Depressive Illusions. A bit of background first. Mors Voluntaria is a solo-black metal project from Leeds, West Yorkshire that was only formed this year. Since it's formation though, Mors Voluntaria has released a two song promo and this tape. Hang Me A Noose For My Smile was originally on the earlier 2013 promo. This is more of a noise song than a black metal song at first listen. It features a lot of winding noise and screams that seem to intertwine with it. It rumbles on it that fashion for five and a half minutes, kind of acting like a semi-instrumental track. Mors Voluntaria end with Suicide II, which picks up where Suicide left off. There's a lengthy instrumental build up, as you'd expect but there is more melody poking through. The drums can be heard in the background alongside a droning bass-line. This song is purely instrumental. Overall this is a tape of three very different parts. 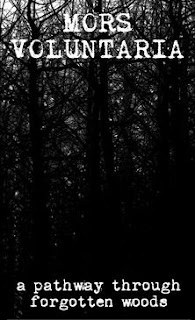 It sees Mors Voluntaria exploring it's sound and influences.There's definite potential here and with more writing, recording and production time, I can see Mors Voluntaria progressing into a truly great British black metal band.